The Set contains: Old Friend Ruby, Old Friend Tawny, Old Friend White, Lágrima, Reserva, White&Dry. Gift package in a cardboard box with a clip. Deep ruby-red colour with halo granate. Classic nose, where the vivacity of the young fruits converge in a delicate balance. Determined taste, vigorous, with aromas of fresh fruit and a long and harmonious finish. Orange-brown color. The ageing in oak casks gives it an aroma of vanilla combined with fruit. The palate is soft and balanced with a good finish. Brown coloured with a brown-tawny halo. A powerful and rich spicy bouquet with vanilla subtle touches. On the taste it is complex, harmonious and with a quality finish. 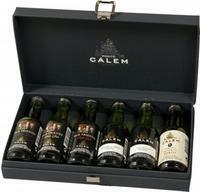 Wine from the Douro region with traditional fruit flavors. Ruby type wines are a blend of young wines fortified with wine spirits. Tawny are expertly blended the young port wine from the harvest of different kinds, produced by the classical method with gently suppressed fruity character, which is characterized by a slightly brown-red color. Port white wine is made only from white grapes. 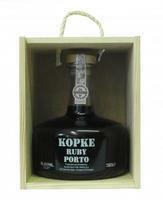 Young white port wine made from a blend of different varieties.